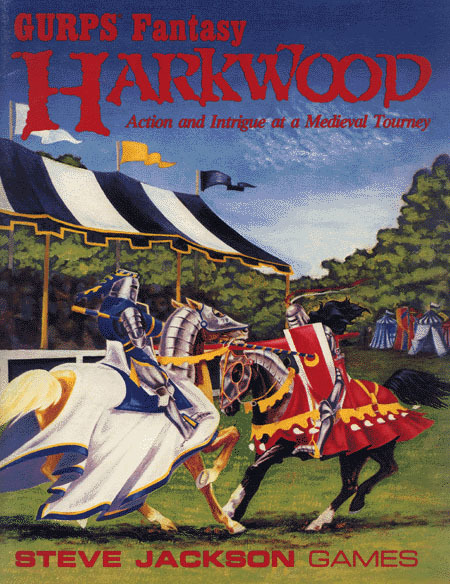 Welcome to Harkwood! Fame and fortune await you in Baron Fenmarc's Prize Tourney, the largest tournament in southern Caithness! But it won't be easy – there are over a hundred knights and adventurers, ready to compete with sword and lance, bow and crossbow. But this year, someone else is attending His Excellency's festival – a base villain, plotting to ruin Fenmarc and seize control of Harkwood. Can this evil Mastermind be unmasked in time to stop his diabolical plan and save the baron and the barony? Tourney Rules – new rules for non-lethal tournament combat and knightly jousting – including the Lance skill! 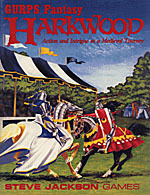 Intrigue in Harkwood – an action/intrigue adventure for 3 to 6 players, set during Baron Fenmarc's Summer's Day Tourney. Caithness – the sourcebook for a medieval kingdom in the world of Yrth, including its sixteen baronies and lordings, and their rulers . . . with the seeds of a civil war in which the PCs can play a heroic part. Harkwood – detailed background material for a campaign set in this Caithness barony, complete with maps of important locations and over 20 non-player characters.